Layers allow you to group similar types of events together on your timeline. For example, in a timeline about your life, you might have one layer for places you've lived, one layer for places you've worked, one for your relationships, etc. Since we added a second layer, the default layer's name ("Events") is now displayed on the timeline. You may want to quickly collapse a layer to hide its events in order to focus on other layers. Collapsed layers are not displayed in PDF and image exports. 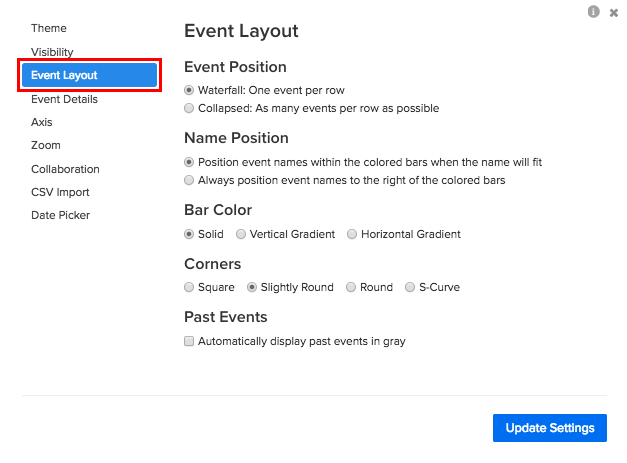 Preceden will normally determine whether to show event dates and durations for events in this layer based on what you select in the Event Details section of the timeline settings. 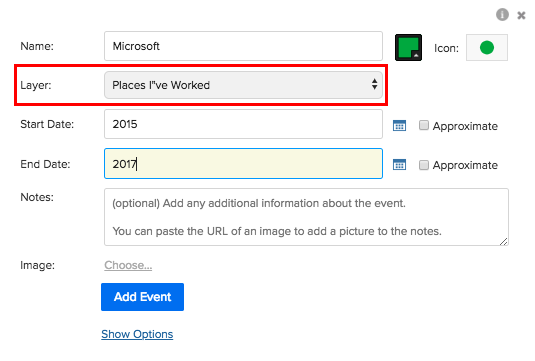 You can check this Hide event dates and durations in this layer option to override those settings and always hide those details in this layer. You can hide individual layers by clicking on the layer and then checking the Hide this layer checkbox. Be sure to click the Update Layer for it to take effect. To re-show the hidden layer, click on the layer's name in the list below your timeline and uncheck this option.